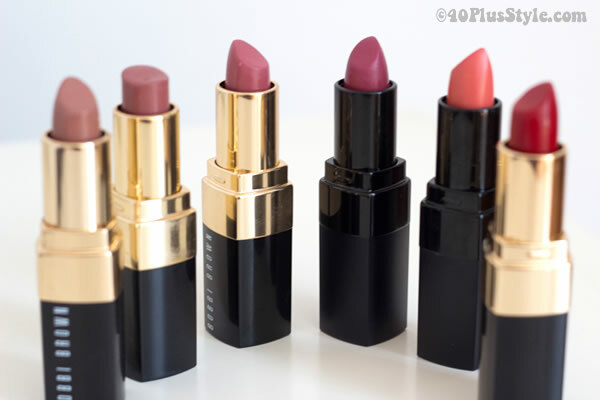 40+ Style » Beauty » Bobbi Brown lipsticks – 6 colours reviewed! What’s your favorite? Bobbi Brown lipsticks – 6 colours reviewed! What’s your favorite? Since lipstick is usually the only serious makeup I use, I decided I should get a bit more serious and adventurous with it. So I decided to add a few more colours to my lipstick repertoire! I decided to stick with a brand that I have been using for a long time: Bobbi Brown. I like this lipstick for its reliability, pleasant feel on the lips and hydration attributes. So this review is not so much about how good Bobbi Brown lipsticks are, but more about the colours and which ones are good for me and other women over 40. The lipstick I always wear the most is the most natural one. It’s the one totally on the left and I pop it one whenever I go outside. It suits every outfit and I actually quite like my natural look. The second lipstick was another lipstick I already owned. It’s a bit darker than my natural one and although the colour on the lipstick says brown, I feel it actually has a more reddish tone when put on the lips. This was my go-to colour if I felt that my lips needed a bit more colour. However, as I get more daring with wearing colour and enjoy wearing reds and oranges, this colour was no longer sufficient. I needed some more colours…. Sometimes my outfits are more pink than brown or red, so I decided it was well worth investing in a pinkish colour as well. It just gives my face a little more colour and will look good with my favoured old pink outfits. I feel from the pictures that this colour looks pretty good. Ok, here we are getting into more untested waters. The lipstick below is a darker and more covering pink. Great for that extra pop of colour or doing a bit of colour blocking with bright outfits. But it ads more maintenance to my look (not a big fan of having to readjust the lipstick all the time…) and is getting on the dark side. I think it will look great with a brighter pink outfit though or other colours that are quite bright. Since coral and orange are the IT colours this year and I purchased a few items in that colour, I thought it would be fun to add an orange to my new arsenal of lipsticks as well. This colour was quite strong on the lips although it looks good on the images below. Definitely great with outfits that include orange or coral. Full on red is definitely a challenge and a look I find very difficult to pull off. This is definitely an ‘evening only’ lipstick as I find this colour quite bright. I have actually softened the red a bit but putting a little of my natural lipstick on top of this, which makes it a bit more wearable. As I described in my 10 beauty secrets for women over 40 a darker colour lipstick is more aging and I feel you can see that in the pictures below. Still, for a fancy evening out, when my outfit needs an extra splash of colour or when I want to complement the red of my outfit with my lips, I think I will use it (occasionally). I think I’m going to have fun with my new lipsticks. It gives me yet another item in my toolbox to look hip, add more colour, have fun with fashion and beauty and look and feel great! Bobbi Brown cosmetics can be bought online at Bloomingdales and StrawberyNet. How about you? Do you change your lipstick colour a lot? Because it is so cold and windy where I live I go through many tubes of lip balm. I have 5 different brands right now with probably 10 in rotation – in my purse, in the car, by the back door, on my nightstand, in my bathroom – you get the idea. I wear it 24/7 and reapply it constantly. Lipstick is something I wear only if I am dressed for an event. I wear Clinique and my newest shade is “Blushing Coral” to go with the orange clothing I have been buying this Spring. I am never brave enough to wear red. I have never been a big fan of lip balm. I sometimes feel that the more I put on the more sensitive my lips seem to get. Last year when I went to cold Europe, I was meticulous in applying my most natural lipstick. It kept my lips hydrated and really helped. Interesting that you are not a lipstick wearer…. You are not the first person to tell me this about lip balms. I wonder if lipstick would be better? I would have to buy 10 tubes of the same color to leave all over the house – LOL! My make-up addiction is mascara – I buy 3 tubes at a time and always have it on. I even have a conditioning type I can wear to sleep in. My lashes are my favorite facial feature. You could give it a try maybe. Choose a natural shade like beige 2 and find a lipstick that feels good on your lips. As mentioned I’ve been very happy with Bobbi Brown but I think Clinique is good too. I would love to wear more mascara, but my eyes are very sensitive and they always feel irritated afterward, so I’m leaving it off most days…. I wear red lipstick with a blue undertone. I found my perfect color( Christian Dior – rouge de fete – nr 863), but a year ago it was discontinued and since then I am searching for the perfect replacement. Found acceptable substitutes, but still did not find the 100% right one. Very difficult and frustrating! Of the colors you show in your post, Sylvia, the one I find the least nice on you is soft coral 7. The brighter rose is a nice addition to your usual colors, which suit you well too. Actually, all the other ones look nice on you, I think. Let me know when you find it! Thanks for the feedback Anja. Lately I’ve been leaning in favour of the more natural shades in neutrals, browns and dusky pinks. I’ve stopped using red and dark lipsticks. Interesting to note that you’ve mentioned that a darker colour lipstick is more aging. I have to use some sort of lip balm before I use lipstick though because my lips are very dry. I use Estee Lauder’s lip conditioning balm. Have you tried burt’s bees lip balm? I use that when I travel. I like the first 3 lipstick colours you wore. I haven’t changed my lipstick in ages, time to go shopping 🙂 Thanks for an informative and fun review. As you can probably tell from my blog I LOVE lipstick and am aleays trying out new colors and brands, though I must tell you I have a hard time with neutrals. I gravitate toward strong colors, and although I have read that I should be putting aside all the fun, darks nd bright colors of my youth I just am not ready yet. I like the coral and the pink as well as your new red. They’re fun and they all look good of you. Like you I wear lipstick rather than balm and my lips are always soft. I’ve read some bad things about balm (menthol is bad for lips) so I usually avoid it. I know Heather. You were my inspiration for buying more colours. And YOU can certainly wear those bright colours. They don’t seem to age you at all…. In the end I think it’s different for every woman. Just be more mindful that dark colours, browns and brights may possibly age some women more. Some of the ladies at advanced style also still seem to be rocking the bright lipsticks so some women can just pull it off. It’s such a good idea to show how the various colours actually look on a person as opposed to swatches! Now I’m not much of a lipstick wearer either, but that’s mostly because I’m too lazy to reapply lipstick throughout the day. I’ll wear it on special occasions though. As for lipstick colour, I’ll either go for a fairly neutral one or a darker berry shade, depending on the occasion and my outfit. I don’t like wearing red lipstick, it doesn’t look good on me and for some reason makes me feel like a kid playing dress up;) On workdays I’ll just go for a neutral, creamy, moisturising lip balm – not the waxy stuff that will actually dehydrate my lips. My current favourite is from FACE Stockholm. Thanks Nanne. Yes, the colour look quite different on lips don’t they? I really like reapplying too, which is why I favor the natural colours. It’s not so obvious when you’ve been lazy with this. I see what you mean regarding red lipstick. It’s definitely in a league of its own… Thanks for your tip on balm! I like those colors,very seductive. but I never change the product which I have,because my lips are very sensitive.maybe I should try this once. You could always ask for a sample or try it out once at one of their stores. But if you already have a brand you love, perhaps just stick to that…. When I come thru your blog I always think you’ve been a fly on the way. Great minds. I just applied for a pro card with Bobbi Brown, her cosmetics are second to none. I wear red lipstick when I’m going to a cos play, I used to be sailor moon and red lips is perfect match on my white skin.I like to try that full on red product. Really enjoyed this piece about lipsticks for us over 40 gals. I was inspired by you (ok, and my boyfriend) to tone down my makeup; and actually I was finding that it was making my 46 year old skin look even older! Funny thing is that I rarely wore lipstick and my mom who is from the “lipstick era” was always encouraging me to wear it. Well, now that I’ve gone to more a natural look, I’m really embracing the way lipstick brightens and enhances my looks. I tend toward darker or brighter colors. Also, thanks for including the pictures. It was so much fun to see your transition from the nudes to the brights & darks. Wonderful to get your feedback Jane. I’m always wondering if my articles are helpful, so it’s great to read that you enjoyed it. Yes, I think that lipstick can add that extra sparkle when you keep your makeup natural. That is also the reason why I wanted more variety! At first I thought: “this item is not for me”. As I always, always wear bright red lipstick of Kanebo, Sensai, number 1, The Lipstick. Very expensive (55 euro), but also very good. Then I read your article anyway and saw the photos. I was amazed. You look good with all colours. How can that be? You inspired me to try more colours in lipstick. One thing about orange lipstick though. Being a fan of orange outfits, I tried that colour lipstick to match. But… my teeth aren’t very white by nature and with orange lipstick my teeth looked practically yellow. Very nasty. I know I should cut back on coffee but that is my only vice. And I don’t dare to bleech my teeth as I am afraid it will harm them. So no orange lipstick I am afraid. But I am going to try other colours. I’m a natural girl so I like the first two colors the most. The red 10 looks great on you though. I’m sure those 2 will still be my most used lipsticks, but whenever I want more colour (which is always increasing) I will use the others as well. Thanks for your feedback! I love those collections and color of lipstick, sometimes my friends tease me that I look like a vampire, cause I always used a full red on my lips, and my skin is so white, looks like a human without blood.I definitely try those products just to be unique. Interesting point Karen and thanks for the feedback. This would never have occurred to me. I used to wear the color coral a lot. I had a few different brands of lipstick that were a great match to the coral shade. Now I wear a wide variety of colors in my clothing. I tend to wear a coral lipstick or a darker pink lipstick. When I go to a makeup counter and ask the gals which color they think I could wear with most of my clothing, they always suggest a neutral shade of lipstick. However, I don’t feel as attractive in a neutral color of lipstick. I don’t like myself in a red lipstick. Sylvia, I like you best in the Brown 4 color. I think it brings out your features the best. With the other colors, I feel I am seeing the color of the lipstick…rather than the best of you. However, I also like the Tulle 34. Thanks for the feedback Laurie! Thanks Suzanne. I will keep an eye out for the Shiseido. I hardly wear any Mascara though as it irritates my eyes and can’t really see myself with blue! I put my lips on last, when I have my top on. I have lots of lipstick colors. U put on primer first. Then, lip liner. Then the color. Sometimes I layer them. Put the moisturizing one on first. Then, layer with cheaper ones. Cheaper have more wax in them and stay on longer. A very stylish giveaway: sterling silver bracelet and a bright red dress! Previous post: What are you passionate about to change in life?